Here is a patient who received a session of approximately 600 CIT grafts to camouflage the large plug grafts from several years ago. 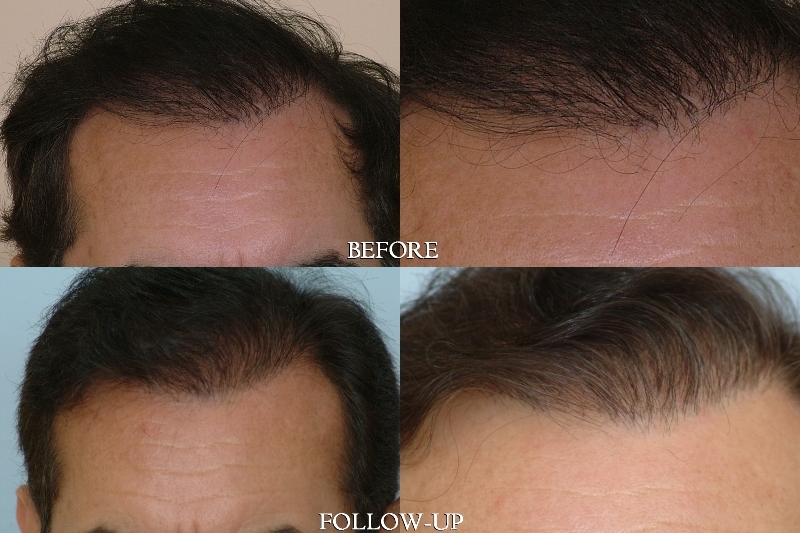 The treatment plan was to add density to the frontal hair line with single hair follicular units. When hair line restoration is performed, the surgeon attempts to recreate Mother Nature’s density. Some patients want to add more density to disguise previous hair transplant work while others desire to thin out the previously transplanted areas for a more mature natural appearance. Removal of the plug grafts is almost always more difficult than extracting follicular units from a virgin scalp. In a typical case of hair transplant, less scar tissue is involved and survival of the newly transplanted hairs should have adequate blood supply in the recipient area. Repair is often referred to as Plug redistribution. We may decrease the size of the plugs to reduce the appearance or totally remove them. Patients may have extremely difficult plugs to remove or may have plugs that are easily removed. Tests can be done so that the patient and surgeon have an idea of how well the scalp will heal. Patients usually will have a few plugs redistributed and have the healthier harvested hairs placed back into the patient’s donor area. The survival rates of these dissected plug grafts remains unknown. Because the plug grafts are sometimes relocated back to the original donor area, scar tissue may cause limited blood supply for survival. This patient elected to have a second session to minimize the appearance of any remaining plugs. 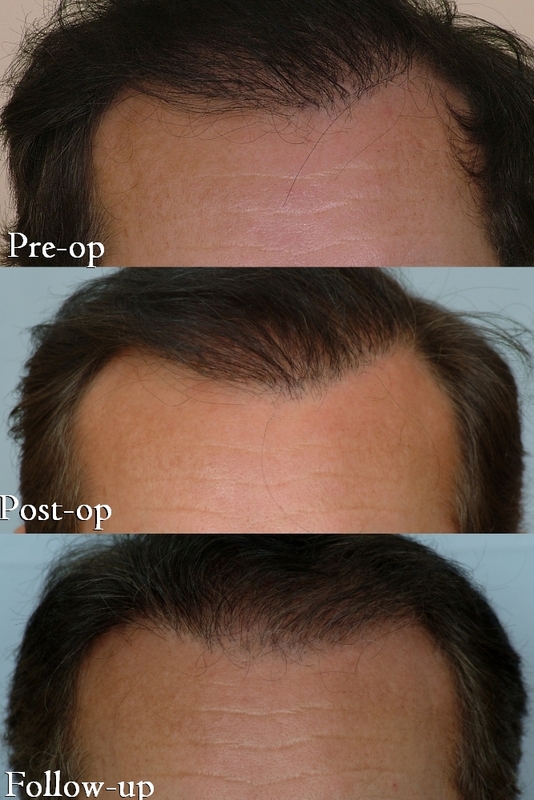 More grafts can be transplanted to create a soft transition of the hair line and frontal scalp. 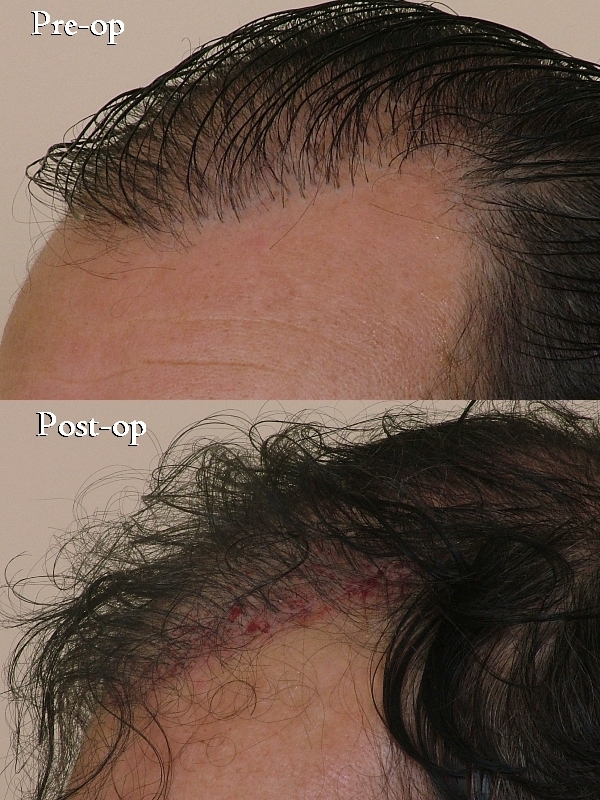 We look forward to the upcoming months for a much more natural looking hair line and a happier patient. Only 600 grafts for that much visual improvement. That’s one hell of a cost-effective transplant session. Here is an update on this patient’s results. The hair line is progressing very well for this patient. » » cost-effective transplant session. » very well for this patient. I have to admit dr Cole, I think you do great work for such small amount of grafts. Excellent touch up to make the hairline more natural looking for just pennies at cost and such small amount of grafts. » just pennies at cost and such small amount of grafts. » » » cost-effective transplant session. » » very well for this patient. Looks very good. Lucky guy. I always like to see noticable results like these from small sessions. That says as as much about a docs. skill as anything, and this shows the refined touch of Dr. Cole, great looking work, huge difference for him. » I always like to see noticable results like these from small sessions. » refined touch of Dr. Cole, great looking work, huge difference for him. The most appealing part of the result is the low amount of grafts, the efficient donor harvesting, & undetectable results. We ask our patients, “Why have a procedure if it will be seen as a hair transplant in public?”, and “why have results on top with bad results in the back (donor)?”. The results may require a couple of sessions, but with each session comes a positive result. After each session, we evaluate how each patient heals and responds to Dr. Cole’s action plan for the next move.